An electro-acoustic, viewer-triggered, live-playing jukebox. Two turntables face each other and spin at their own, slightly mismatched speeds. On the surface of the records are patterns of tape that when read by the needle produce a glitchy abstract beat with granular snippets of the original recording. 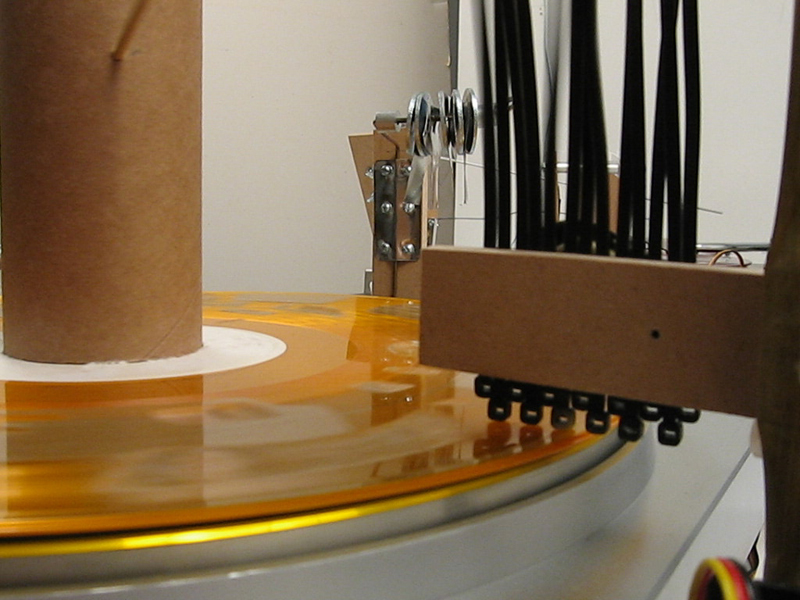 Mounted vertically on the center of each record is a tube pierced by a stick. As the record spins the stick hits a set of objects fitted with contact mics adding a rhythmic pattern of organic sounds – a box of tiny screws, a mohawk of plastic zip ties, a jangly set of metal washers, tweezers that sound like a tuning fork. It is the humble and mostly ignored nature of these objects that lends them a distinctive sonic character. 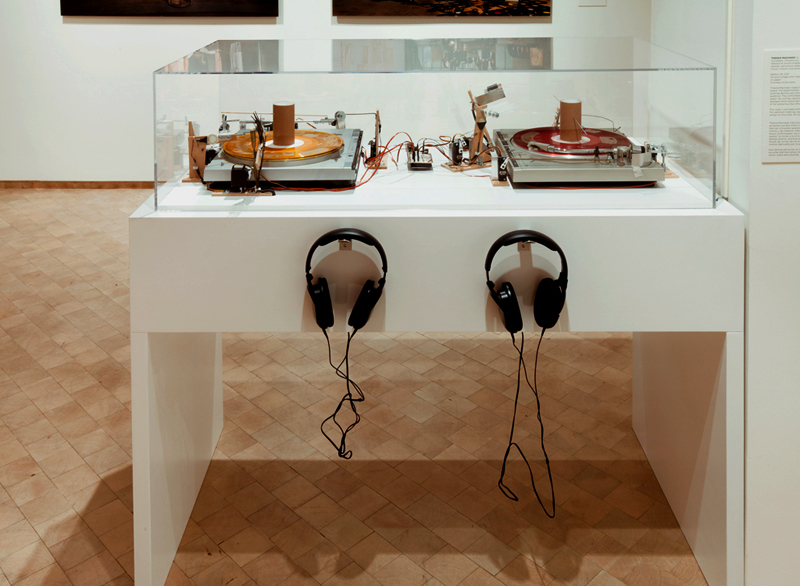 These sound signals are amplified and mixed creating a sonic dialogue between the two turntables. 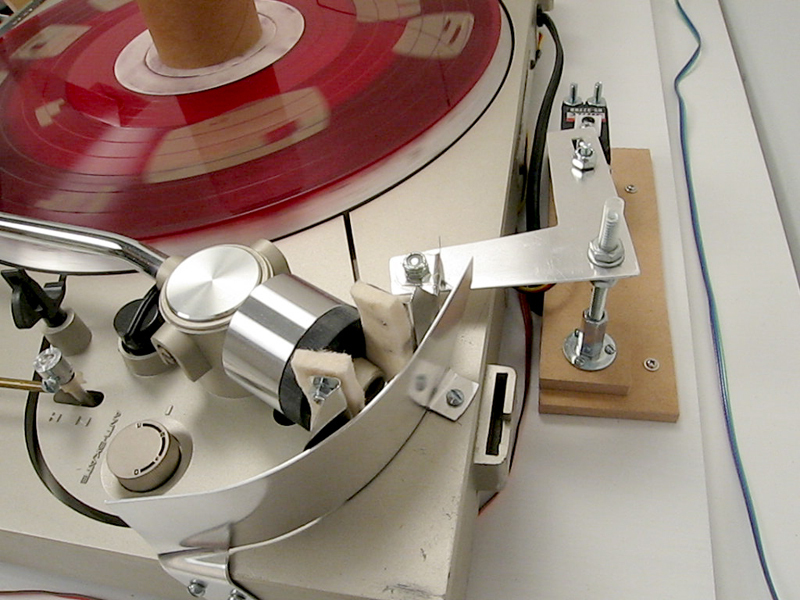 The ultrasonic distance sensor reads the position of the viewer and triggers one of six routines, changing which objects are within reach of the rotating stick, and the position of the needle on the record. 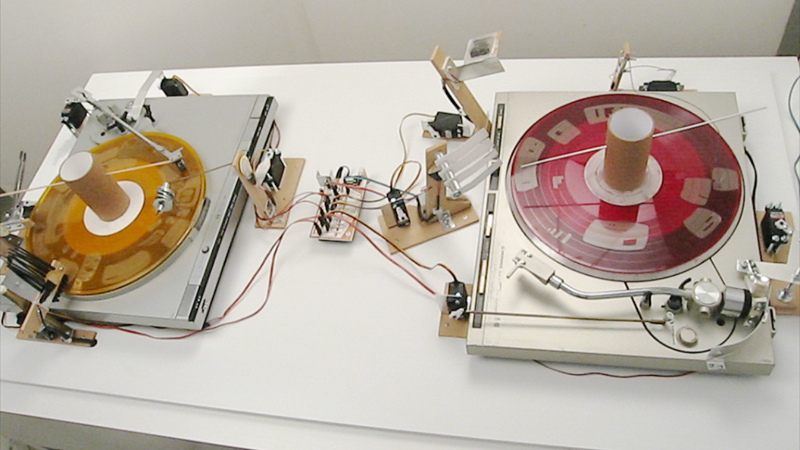 The composition lies in the programming of the arduino environment uses servo motors to activate all the instruments, including the turntables. 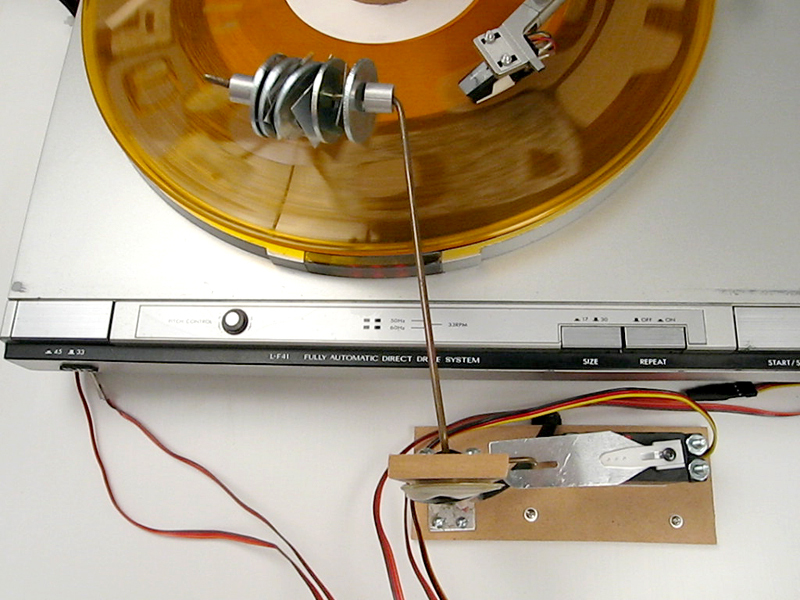 The choreography of action necessary to produce each composed piece is performed by a set of ten motors that will: turn on each of the two turntable by moving the tone arm, change the position of the tone arm, place a changing set of instruments within reach of the rotating sticks and change the position of the needle on the record. Each composition is around 1.5 min and will play through the end before another can be triggered. This constraint of the interactive experience works to dampen some of the too-immediate, one-to-one relationship with the piece, in which the viewer wants to effect a greater, faster, louder change onto the system. The percussive objects are made of simple materials and are given here an opportunity for a better life. Some were found, others bought at the hardware store, none had artistic ambitions. But through the ethos of upcycling and a scavenger’s devotion, these humble materials can rise from their preordained existence. These cobbled-together instruments stand for the incidental rhythms coming from the myriad devices and noises we are all surrounded by. Perhaps their interaction can make us more aware of the latent patterns and systems that hide in the unremarkable. From apparent dissimilarity a consonance can be achieved – a larger rhythmic cycle that can include all the syncopation of individuality.